I’m writing to inform you that the KCSD School Board of Directors has begun the process of hiring a new superintendent following the announcement of the retirement of Dr. Barry Tomasetti, effective January 27, 2020. We have enlisted the services of the Chester County Intermediate (CCIU) executive search team led by CCIU superintendent Dr. Joseph O’Brien. Integral to the process will be communication with you, our district stakeholders. The Board invites your input through a series of staff, parent, and community focus groups. These will be conducted in the near future, and more information will be available on our website soon. The School Board of Directors hopes to have the search process completed by early fall in order to have a superintendent who can assume his or her responsibilities in January 2020. The members of the Board look forward to working with the entire KCSD community to hire an outstanding educational leader to serve as the district’s next superintendent of schools. The Board will provide regular updates on the district’s website, email news listservs, and social media. Kindergarten teachers and staff members create lasting impressions on their students, teaching them new skills, words, and behaviors. Each new experience is a building block in a student’s educational foundation, influencing their path to higher education and beyond. 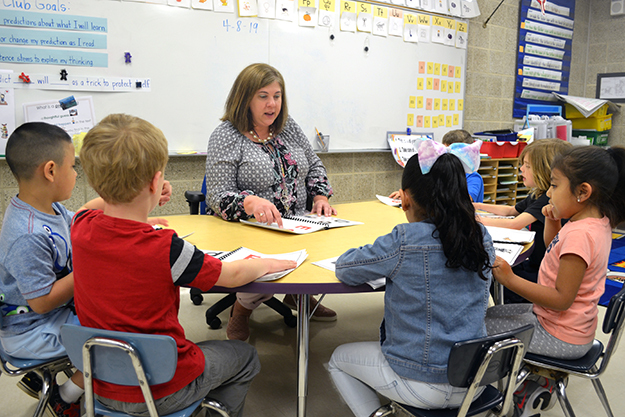 Dr. Tricia O’Loughlin, a Title I Reading Specialist at the Mary D. Lang Kindergarten Center, understands the importance of creating a positive foundation for students. 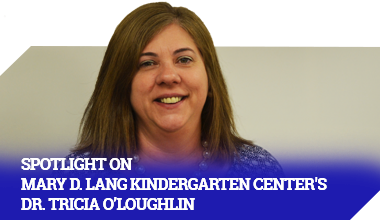 Dr. O’Loughlin began her career at the Kennett Consolidated School District in 2008, when she was hired as an elementary math coach. After three years, she transitioned to become a Title 1 Reading Specialist at Bancroft Elementary School for another three years. Then she moved to Mary D. Lang Elementary Center where she currently works. As a Title I Reading Specialist, Dr. O’Loughlin provides extra support in literacy skills to students of all levels. She also works with teachers as an instructional coach by providing additional resources and lessons to meet all students’ needs. Dr. O’Loughlin is a member of the Professional Development Committee and the English and Language Arts Committee, a co-chair for Multi-Tiered Student Support (MTSS), and a data-warehouse keeper. She is also close with Mary D. Lang’s mascot, Langley the Lion. Dr. O’Loughlin earned both her bachelor’s and master’s degrees from West Chester University. In 2017, she earned her Ph.D. in educational leadership from Neumann University. She enjoys putting theory into practice, bridging academia and the school setting. Dr. O’Loughlin lives in Media with her husband Dan and their two daughters. In her free time, she enjoys reading, travelling to Ireland to visit family and friends, and going to the beach. She stays busy shuttling her daughters to their sports and band practices. Kennett Consolidated School District is proud to feature the hardworking and dedicated staff members who make our District unique and special. STEM Family Night: Build, learn, and create with your children! STEM Noche Familiar: ¡Construye, aprende y crea con tus hijos! UPDATE – Per the following announcement that was issued last evening to our Bancroft parents, the environmental report from 1Source Safety and Health, Inc. is available in its entirety by clicking on the link located at the bottom of this post. This is a very important message from the Kennett Consolidated School District. While performing routine maintenance, our staff discovered small traces of cladosporium mold within the HVAC system at Bancroft Elementary School. We immediately contacted an environmental consultant who performed various tests that verified that the air quality is safe. In addition, the test results indicate that type of the indoor mold is the same as that found outside and that the indoor counts are lower than those found outside – both of these findings are very reassuring. The full detailed report will be posted to the District website tomorrow. Beginning this evening, there will be remediation experts working to eliminate any areas of contamination. We anticipate the remediation to be finalized during the spring break recess. Again, I wish to reiterate that the building’s air quality is well below the range of concern, and we will continue to monitor the levels throughout the year. As always, the safety of your children is of our utmost concern, and while this issue poses no health risks, we wanted to keep you apprised of this situation. Have a good evening.